Saint Julien Hotel is located in the centre of Angers and welcomes you for business trips, weekend getaways and holidays. 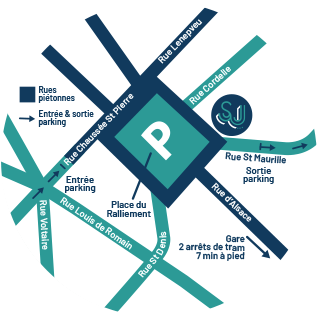 If you arrive by train, the hotel is near Saint-Laud Station and all public transport. If you arrive by car, you can easily park at the nearby public car park (€2/night, €20/24hr). Once at the hotel on Place Ralliement, the town centre lies at your feet. Just a few steps will take you to Boulevard Foch or the pedestrian Rue Lenepveu. Want to go shopping or need services (shoemaker, drycleaner, etc.)? You are surrounded by Angers town centre businesses. For sightseeing trips, many cultural sites (chateau, cathedral, museums, etc.) can be reached on foot. If your trip is for work, take the tram or bus networks to get where you need to go (hospital, businesses, universities, etc.). The three-star Saint Julien is a charming seventies hotel. Our three room categories and numerous options available let you choose exactly what you need for your stay. Each category been designed to match the theme of seventies icons. These include top music groups, actors and other political figures. The ‘famous’ rooms are the hotel’s standard category, with a minimum room size of 16m2, while the superior rooms are ‘renowned’ and ‘legendary’, with generous room sizes, a minimum of 20m2 and a range of complementary services. Our hotel team can provide cots, roll-out beds, family-friendly rooms, and twin or double beds to make your stay more enjoyable. This space has flexible opening times in addition to offering a view across the historical, central square in Angers while you enjoy a continental breakfast. You can even treat yourself to a sleep in without worrying about missing your first meal of the day! Enjoy guaranteed high speed internet! Fibre wifi is provided free of charge. Saint Julien Hotel will soon be opening a bar where guests can relax. This welcoming space will be open from 10am to midnight serving cocktails, refreshing fruit juices, cold meat and cheese platters, and more. Perfect for your happy hours! Our hotel also offers room service for meals. Available from the bar or served to your room, Meunier dishes let you dine at the hotel.